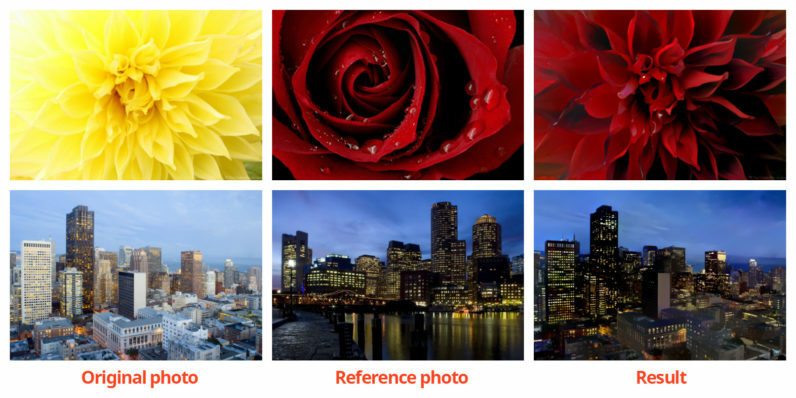 A bunch of researchers from Adobe and Cornell University have come up with one of the coolest developments in imaging tech in recent times: the ability to transfer photo styles from one picture to another. That means that if you’ve got a picture of a cityscape shot on a sunny morning, you can have it look like the photo was taken at dusk by introducing a reference image photographed in the evening and with matching weather conditions. The end result won’t have any of its lines and shapes altered. What’s particularly impressive about the algorithm is that it can make intelligent minute adjustments like adding light to the windows of a skyscraper – similar to how a human photo retoucher would approach the challenge of mimicking a reference photo. Plus, it avoids issues like copying over the appearance of the sky from a reference image onto a building in the target photo. To achieve this, the researchers used deep learning methods to capture the lighting and color cues from the reference image, and also worked on a way to constrain the transformation so the changes applied in a natural way to the target photo without coloring outside the lines. Hopefully, this technology might one day make it into a commercial photo editing tool like Adobe’s Photoshop or Lightroom apps. You can check out the research paper here and have a look at the code in this GitHub repository.